So happy you stopped by today. I made a quick little card for this week's Mojo Monday sketch challenge. I used one of my favorite patterned cardstock packs, Authentique's Lively Collection. I decided to use some of my recently organized Washi tape with this challenge along with one of the cute little bird and sentiment stamps from Iron Gate Stamps' Birdhouse and Weathervane sets. Love this! Thanks so much for playing with us in the Love To Scrap! Challenge Blog's Recipe challenge! Beautiful Card! Cute image. 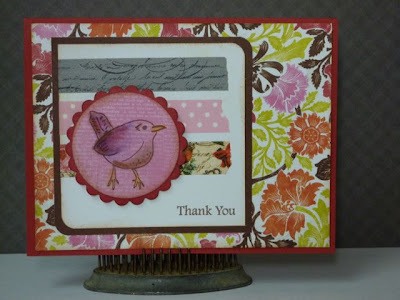 Thanks for joining us at Loves to Scrap! Recipe Challenge. Great use of wash tape, I never know how to incorporate it onto a card. What lovely colors on your card. Thanks so much for joining us at Love to Scrap! challenge blog. I like how you used Washi tape and the card looks so cheery. Thanks for playing at Love to Scrap!!! Adorable Tammy! Lovin' the bird!